Level A Chemical Resistant Coveralls provide the highest level of protection. Level A suits are worn with a self-contained breathing apparatus (SCBA) or supplied air systems to provide ultimate respiratory protection. Level A suits are designed to protect wearers from eye or skin damage from hazardous vapors, gases, particulates and sudden splash. Level A chemical resistant coveralls provide the highest level of protection available. Worn with self-contained breathing apparatuses (SCBAs) or with supplied air respirators (SAR), Level A coveralls prevent contaminated air from reaching the worker encapsulated in the suit – and in many cases, they save lives. At Enviro Safety Products, we have two main goals: to provide the best personal protective equipment at the most affordable prices, and to keep our customers OSHA-compliant while maintaining their workers’ safety. That’s why you’ll find an extensive selection of Tychem TK Level A coveralls in our catalog, where everything you see listed is currently in stock unless otherwise noted. We invite you to browse our collection so you can find the ideal protection for your workers today. First responders, fire fighters, researchers, HAZMAT technicians and other workers operating in toxic environments often need the highest level of protection – and Level A is as good as it gets. Designed to withstand toxic vapors, gases, particulates and sudden splash, Tychem TK Level A coveralls are durable and reliable in the toughest situations. The military’s Chemical, Biological, Radiological, Nuclear and Explosives experts wear Tychem Level A coveralls to mitigate risk of toxic exposure on the battlefield; state and federal HAZMAT teams wear them when responding to emergencies on the home front. FBI agents wear them while neutralizing chemical threats, and researchers handling deadly biohazard material in order to create life-saving vaccines wear them, too. Tychem TK Level A coveralls provide protection against hundreds of chemicals; they’re rigorously tested in independent labs to make sure they’re able to keep your employees – and the rest of us – safe. Different versions of Tychem TK Level A coveralls offer different features, though they all provide the highest level of protection against biological and chemical hazards available. Tychem TK Level A coveralls create a completely sealed barrier between the wearer and the outside world. 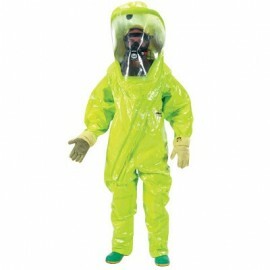 Wearing a , or a supplied air respirator allows the user to get fresh air while working inside a Tychem TK suit. An expandable back makes wearing an SCBA comfortable. Cotton under-gloves (sold separately) keep the user’s hands dry beneath the attached outer Kevlar and inner Nomex gloves. A wide, sturdy zipper covered by a double storm flap with Velcro closures trails from the wearer’s hip to the two-layer Teflon face shield to keep all unwanted materials on the outside of the suit. Tychem TK Level A Deluxe suits, like the Level A coveralls, are fully encapsulated and puncture- and tear-resistant. 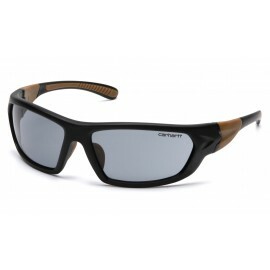 They provide the highest level of protection available. With an expandable back to create room for an SCBA, a durable zipper covered by a double storm flap and Velcro closure, and a two-layer face shield, Tychem TK Level A Deluxe suits are also highly visible in low-light conditions. Two exhaust valves, a three-layer glove system and a 1.5-inch waist belt make Tychem TK Level A Deluxe suit a cost-effective solution for your HAZMAT needs. Tychem Level A Standard suits protect against corrosive gases, toxic liquids, and other dangerously hazardous materials. Durable and puncture-resistant, Tychem Level A Standard suits feature a gas-tight zipper, butyl gloves, two exhaust valves and attached sock boots with boot flaps. 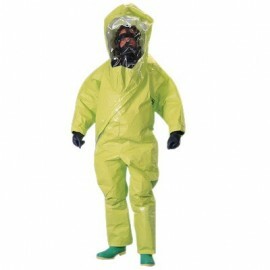 Standard Level A suits are highly visible in all light conditions and feature a rugged PVC face shield to protect from splashes, fumes and other hazards. They work with both supplied-air respirators and SCBA units to keep users safe from inhalation hazards. Tychem TK Level A Standard suits are also available with expandable backs to make wearing an SCBA more comfortable. 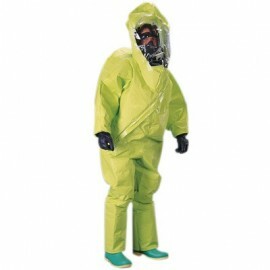 Finding the right size Tychem TK Level A suit is essential to working comfortably inside. Wearing the appropriate clothing beneath a Level A suit can allow the user to work longer and more effectively, and keeping a small cloth inside to wipe away condensation from the face shield keeps the user’s field of vision clear. 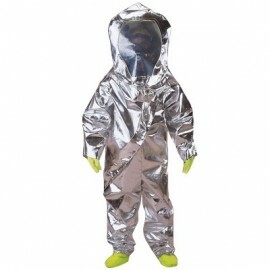 Ordering Tychem TK Level A coveralls from Enviro Safety Products is easy. Just make your selections, click “Add to Cart" and proceed to our secure online checkout. We’ll ask for your email address so we can communicate with you about your order, and then we’ll ask for your shipping and payment information. We’ll begin processing your order as soon as we receive all the required information.